It is now axiomatic that a priority policy and practical goal of countries?developed and developing?is the creation and maintenance of viable, robust, yet stable financial markets (bank, capital, insurance, mortgage, and pension) for the purpose of fostering broader, sustainable economic growth and development. To achieve such financial markets requires significant financial infrastructure law reform and related technical assistance. This volume endeavours to capture a selection of the main developments in the area on an international, regional, and major country basis. 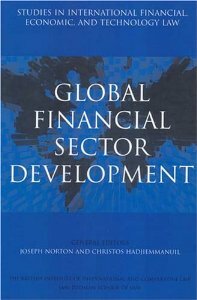 On the international level, discussion is provided as to the evolving role of international financial institutions in the area of legal development cooperation (Dean Sandgren), the growing global trend of ?privatization? in modern bank regulation, the role of the International Organization of Securities Commissions (IOSCO) in convergence an creating an ?international passport? for securities offerings (Professor Arner), the intervening concerns of fighting the financing of terrorism (Gardella), and the treatment of financial services under the WTO?GATS regime (Wang). On the regional level, this volume presents critical perspectives from Africa (Dr Adesegun Akin-Olugbade), MERCOSUR Region (Dr Holz), the European Union (Tagliamonte). With respects to selective key country financial sector reform and developments, consideration is given to the US (Restrepo), PRC (Wu), South Kores (Baik), and Iraq (Al-Nuwaiser).